Inflammation of the scalp can occur for all sorts of reasons, including allergy, illness, injury or poisoning. Whatever the cause, it can have a bad effect on your hair, loosening its roots and causing it to fall out. Understanding how this works can help you to tackle the problem and cope with the consequences. Although the triggers of inflammation can vary, the essential mechanism is the same. It's a build-up of fluid in tissue, usually accompanied by large numbers of immune cells. It's the body's response to damage or infection and it's designed to protect us. The scalp is an area particularly receptive to inflammation because it's important for the body to prioritise protecting the brain. Because inflammation puts an extra strain on tissue, especially skin, it often aches or feels itchy. This is especially true if it happens quickly. Where you experience this sort of sensation for more than three days, you should visit your doctor to get it checked out. Unfortunately, inflammation that builds up slowly can be harder to detect because the tissue has time to expand to accommodate it. Swelling may not be visible underneath the hair. When you touch inflamed tissue it should feel softer than usual, and slightly spongy, beneath your fingertips. This will often be accompanied by acute soreness within the tissue itself, fading after you take the pressure off. Inflammation causes hair loss in two ways. First, by putting pressure on capillaries, it can block the transport of nutrients that your follicles need to build health hair. This means that individual hairs can become thin and start snapping. Second, inflammation can trigger the hair follicle to 'commit suicide'. All our cells have the capacity to do this – it's the mechanism by which old cells die and are conveniently broken down to make room for new, more efficient ones. The problem is that if it happens too soon then the scalp will start to shed hair with no way of replacing it. 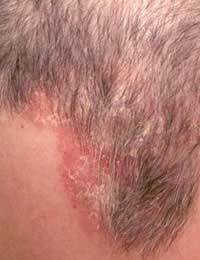 Not all cases of inflammation of the scalp can be prevented. Sometimes, for instance after an injury, it's better to let mild inflammation subside in its own time, remembering that it's there for a reason. It's generally best to try to establish the cause of inflammation before treating it, as it may be a sign of infection that needs to be treated. For mild chronic inflammation or short term, more intense inflammation, aspirin or ibuprofen can be a very effective treatment. Caffeine can also help in the short term. Serious chronic inflammation usually has to be treated with stronger drugs, such as steroids. These can be administered topically, as an ointment you rub into your scalp, or orally, though the latter method is more likely to have side effects so is only used in really serious cases. You can also help to tackle mild inflammation by applying lemon juice or vinegar to your scalp. Bear in mind that if your skin has been punctured by the swelling, this can sting! It should draw out excess fluid from the inflamed tissue, providing short term relief, though it won't tackle the underlying cause. Rinse it straight off after treatment. Sometimes chronic inflammation can be reduced by changing your diet. Dairy produce and potatoes can trigger inflammation in some (but not all) people – try going without for a week and seeing if it makes you feel better. Green tea is particularly good at reducing inflammation when you drink it and can also be used as a rinse when you wash your hair. You can also try consuming more fish, nuts or olive oil. Some recommended anti-inflammatory diets include foods high in copper. These are a bad idea for people suffering from hair loss as to much copper can poison your hair. If you plan to take any supplements alongside making dietary changes, it is always a good idea to Consult Your Doctor first.